Given the severity and length of the Great Recession, whether or not Europe needs more or less integration is a much less consequential discussion than that Europe needs better and more effective integration. 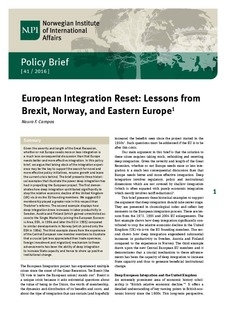 In this policy brief, we argue that taking stock of the integration experience may be the key to support the search for novel and more effective policy initiatives, resume growth and leave the current crisis behind. The brief presents three historical examples that illustrate the power deep integration has had in propelling the European project. The first demonstrates how deep integration contributed significantly to stop the relative economic decline of the United Kingdom (UK) vis-à-vis the EU founding members. We suggest EU membership played a greater role in this respect than Thatcher’s reforms. The second example displays how deep integration drove increases in labor productivity in Sweden, Austria and Finland (which gained unrestricted access to the Single Market by joining the European Economic Area, EEA, in 1994 and later the EU in 1995) compared to similar developments in Norway (which joined only the EEA in 1994). The third example draws from the experience of the Central European new member members to illustrate that a crucial (yet less appreciated than trade openness, foreign investment and migration) mechanism to these advancements has been the ability of deep integration to increase State capacity and hence to shore up positive institutional change.